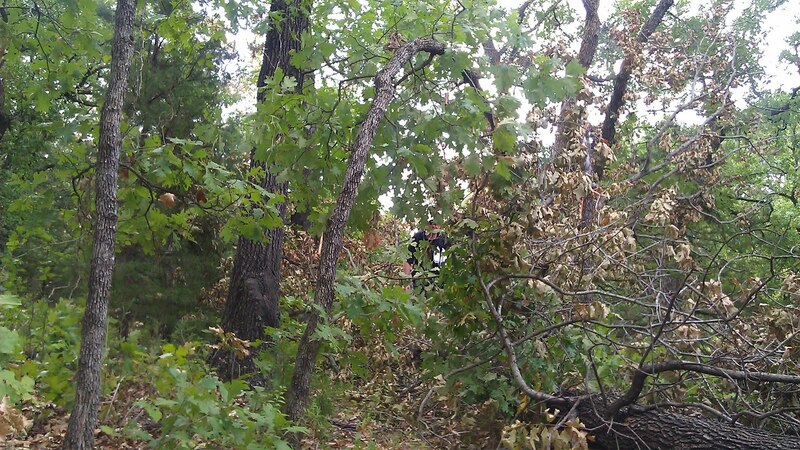 Trailzenner : Bushwacking at Lake McMurtry. OTRA made a little road trip to Lake McMurtry in Stillwater, OK on Saturday for our long run which is about a 1.5 hour drive from home. I was looking forward to this all week! 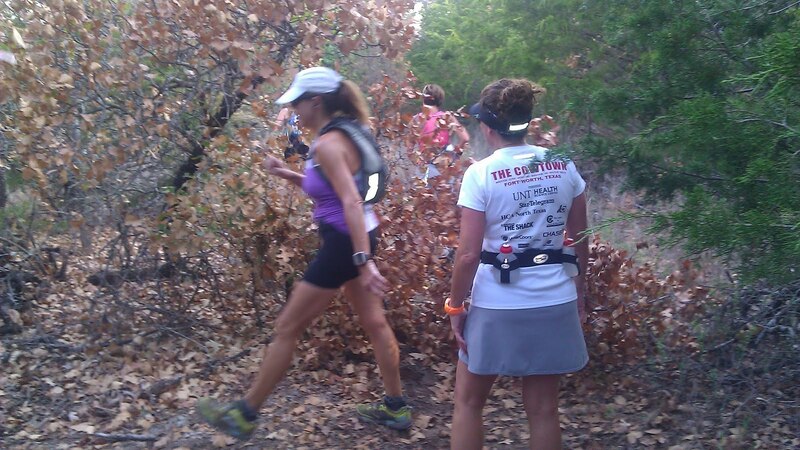 McMurtry holds a special place in my heart since it's where I ran my first ultra. 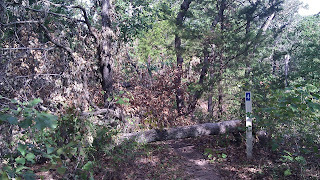 After just 2 minutes of hitting the trail we knew we were going to be in for some slow running. 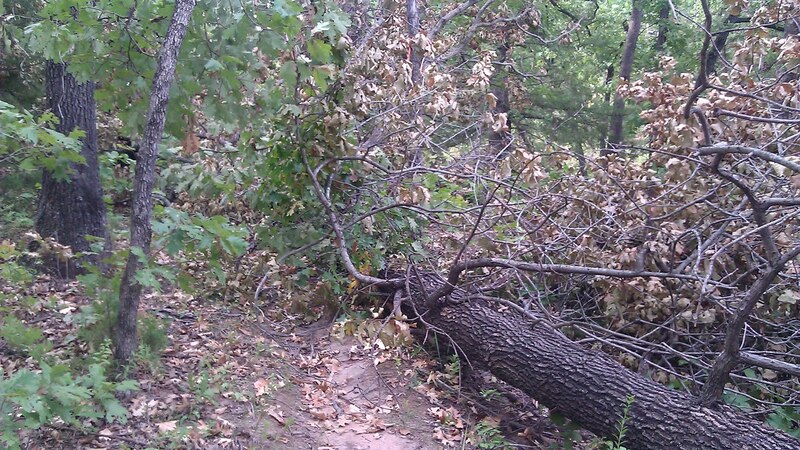 Recent storms had left the trails in really bad shape. 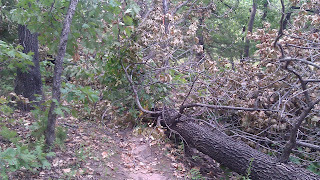 Downed trees, limbs and debris all over the trails. In some places it was hard to even see if you were on the trail! 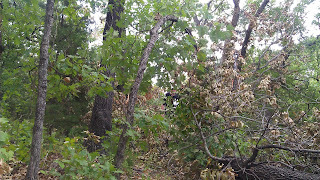 To make it even more difficult, our extremely hot and dry summer had caused the trees to prematurely go dormant and drop their leaves, so in places we were running in deep leaves, sticks and branches. 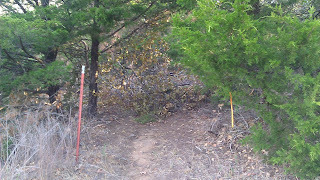 Clearing the trail? 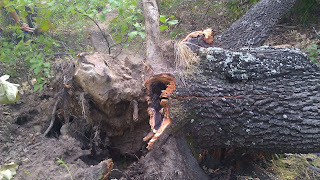 Or goofing off..
Finding ways around the downed trees. 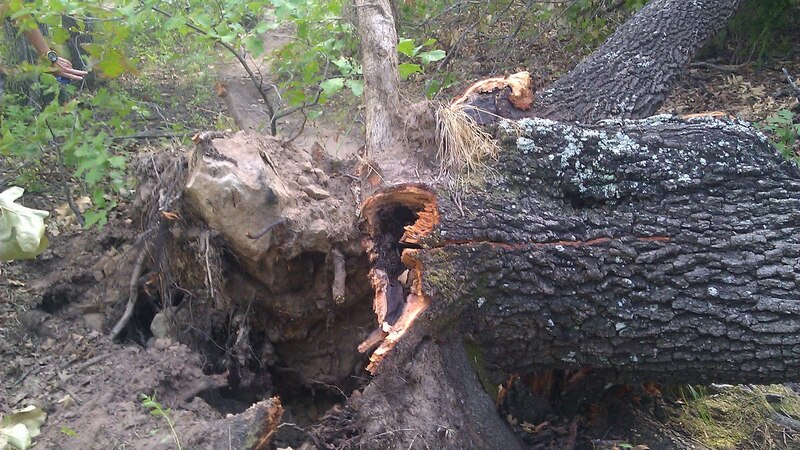 If you look close you can see Don trying to make it through. But, in typical OTRA fashion we had a great time. :) I had planned for 16-18 miles but had to stop at 13 and call it good. The temps were nearing 100 degrees and I'd let myself run out of water and get pretty dehydrated on the last loop. We soaked in the lake, changed clothes and drove into Stillwater for some lunch. All of us (especially Don!) have some pretty impressive scratches and scrapes to show for our bushwacking trail run. 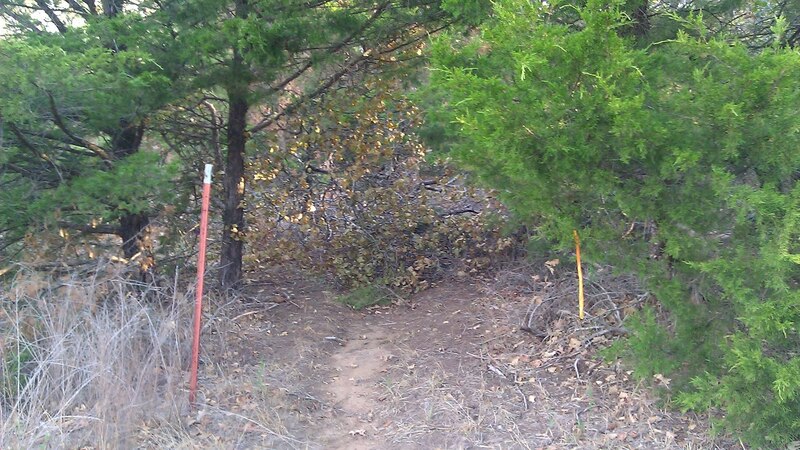 Even with all the storm damage out there, I love those trails. 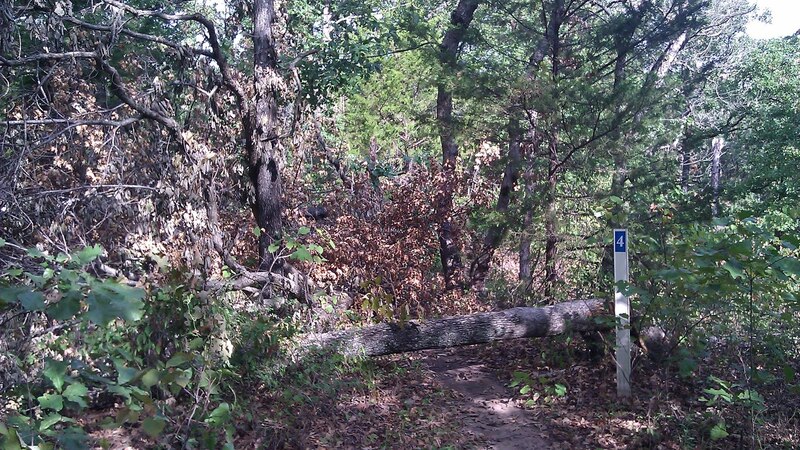 Can't wait to go back in April for Lake McMurtry Trail Race! All in all, I got in some good training for Do-Wacka-Do which is 3 weeks away. 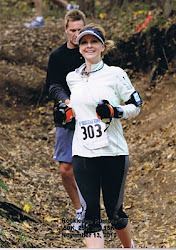 Still undecided on which distance I'll do, the 25K or the 50K. It sounds like a challenging, fun time! 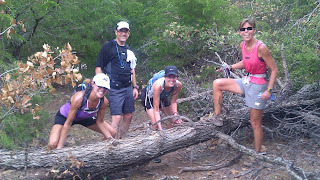 And a fun group to run with! Our temperatures are finally starting to cool off, I hope yours do as well!